A 40-year-old florist presents to your office complaining of a nontender nodule that formed on her hand, then enlarged, and finally ulcerated. In the days that followed, the patient developed similar nodules in the area of the axillary lymphatics. Otherwise she has had no other symptoms. Sporotrichosis is a disease caused by inoculation of the plant Sporothrix schenckii when patients prick themselves with a thorn. 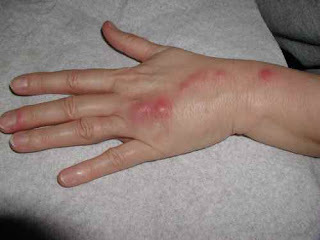 The condition is associated with the formation of nodules, ulcers, and abscesses affecting the skin and lymphatic system. Farm workers and those who work around plants (i.e., florists, gardeners, nursery workers, and horticulturists) such as sphagnum moss, rosebushes, and barberry bushes are the most likely to be affected. form in the area of the draining lymphatics. Local pain and constitutional symptoms are usually absent. Other areas such as lungs, spleen, liver, kidney, genitalia, muscle, joints, and eyes may become involved. Diagnosis is usually achieved by culturing the organism from the nodules. Treatment is accomplished with itraconazole and extended courses of saturated solution of potassium iodide; in severe disseminated cases, intravenous amphotericin B or ketoconazole (less effective) is used.